Wanna see a million ESX licenses? 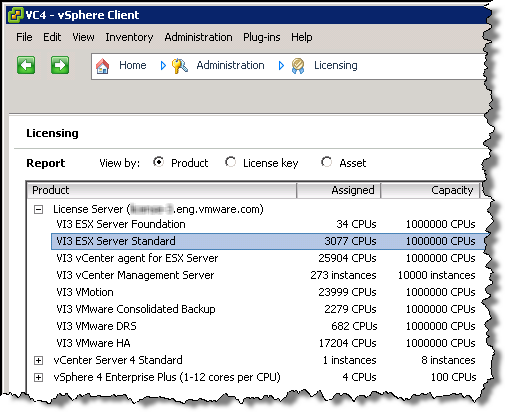 If you have used VMware VI3 and vSphere 4, one thing you probably noticed right away is the difference in licensing. To much applause, vSphere no longer uses a FLEXlm license server. While you transition from VI3 to vSphere you will still need to keep the license server around, though. Fortunately vCenter Server 4 is fully equipped to handle the task of pointing your ESX 3 hosts to the appropriate licensing source. The new architecture is a welcome change, but internally it was always very convenient to point to a central license server to quickly set up new VC and ESX systems. Take a look at this vCenter Server licensing report — pointing to one of the internal VMware servers with one million licenses of ESX Standard. Are you going to miss FLEXlm? I’m not. I am DEFINITELY not going to miss FlexLM (although it’s still hanging around for my Citrix XA deployments). I’m also not going to miss having to get customers to log into VMware.com and set up accounts to download license files. VERY pleased with the new licensing system. Plus the awesome feature of being able to control licenses across linked vCenter installations via a single serial number! Can’t wait to get vSphere out of the lab and into our global environment for that reason alone.